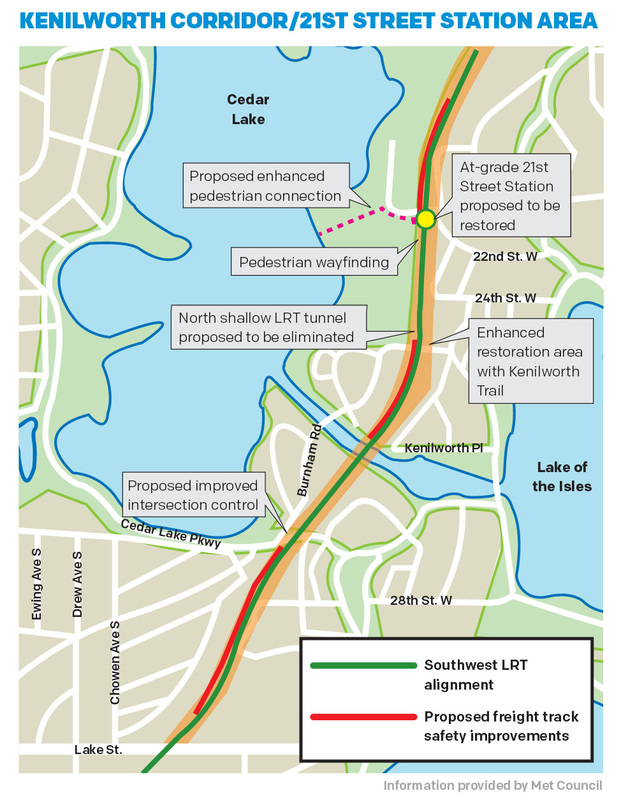 A new agreement on Southwest Light Rail Transit negotiated between Minneapolis and the Metropolitan Council eliminates one of two tunnels proposed for the Kenilworth Corridor and adds a 21st Street Station back into the plan. The changes outlined in a memorandum of understanding released to the public July 8 cut $60 million in costs from the state’s most expensive transit project. Half of the savings from the changes will go toward design improvements requested by Minneapolis, including improved pedestrian access, noise mitigation and landscape restoration in the Kenilworth Corridor. The other half, about $30 million, will reduce the overall cost of the project to about $1.65 billion. A second memorandum of understanding joins the Met Council and Minneapolis in an effort to keep the property underlying the Kenilworth Corridor in public hands, giving local governments greater control over future freight-rail traffic through the corridor. The Hennepin County Railroad Authority controls the land underneath an existing freight line there. The deal, forged in closed-door negotiations mediated by retired federal magistrate Arthur Boylan, is likely to delay the timeline of the approval process for the transit project by a month-and-a-half. The Metropolitan Council approved the agreement July 9, triggering a restart of the ongoing municipal consent process for Minneapolis. The City Council is scheduled to hold a public hearing on municipal consent Aug. 19 followed by a City Council vote on Aug. 29. Hennepin County Commissioner Peter McLaughlin said even with the delay the project is on-track for inclusion in the 2016 federal budget. That’s crucial, because federal funds are expected to cover half of all project costs. Ninety-six people signed up to testify at a three-hour public hearing on the new agreement July 8 before the Minneapolis City Council’s Transportation and Public Works Committee at Anwatin Middle School in the Bryn Mawr neighborhood. Supporters of the plan highlighted the line’s potential to create jobs and spark new development along the corridor and in North Minneapolis. Minneapolis Downtown Council CEO Steve Cramer spoke in favor of the project, describing it as “essential” for the health of the downtown and regional economy. He said he has confidence it will be constructed in a manner upholding the city’s environmental values and commitment to racial equity. Kenya McKnight of the Northside Transportation Network — along with several others who testified — called for a strong equity plan as part of the project, including a commitment to moving forward on the Bassett Creek redevelopment plan and investments in bus shelters, biking/walking paths and new businesses in North Minneapolis. Opponents, meanwhile, raised concerns and questions about the line’s potential to harm the Chain of Lakes and serene quality of the parks and trails in the Kenilworth Corridor. They called for a draft environmental impact statement (DEIS) on the latest plan before the City Council votes on municipal consent later this summer. A group of Kenilworth-area residents calling themselves the Lakes and Parks Alliance argues voting before the DEIS is completed violates state and federal laws, and is threatening to take legal action that could delay the project. Craig Westgate, chair of the Cedar-Isles- Dean Neighborhood Association (CIDNA), expressed frustrations about the compromise. “You’re taking this neighborhood and destroying it right in front of us,” he said. Kenwood Isles Area Association President Larry Moran said high groundwater levels in the Kenilworth Corridor raise serious questions about whether the south tunnel will even be built or if engineers will be forced to run light-rail trains at-grade alongside freight trains. If constructed, the tunnel could require constant dewatering, and that raises yet more concerns about area storm-sewer capacity and the effect of all that water on the lakes, Moran added. Hodges said she sympathizes with neighbors of the project who feel frustrated. “I expect that and understand why residents along the Kenilworth corridor will be disappointed, but the greater good demands that we seek a path for Southwest LRT to move forward,” she said. Under terms of the design agreement, the Kenilworth Corridor “shall be designed to a park-like level of amenity, not only restoring, but improving pre-existing conditions. Minneapolis City Council Vice President Elizabeth Glidden and Council Member Kevin Reich, chair of the Transportation & Public Works Committee, were also involved in the mediation process. “This was about how to make this project better than originally proposed in a way that serves more residents of Minneapolis and protects the Kenilworth Corridor in a better way than proposed,” Glidden said. This entry was posted in Southwest LRT on July 27, 2014 by citoyen1789.